Get exactly the Toothflix 2.0 videos you need, where you need them! The Complete Series Bonus Pack combines the Complete Series DVD and the Reception Area DVD at a savings of $149. An appealing mix of live characters and 3-D graphics make Toothflix 2.0 an essential educational tool—and it’s so simple, your entire staff can use it. 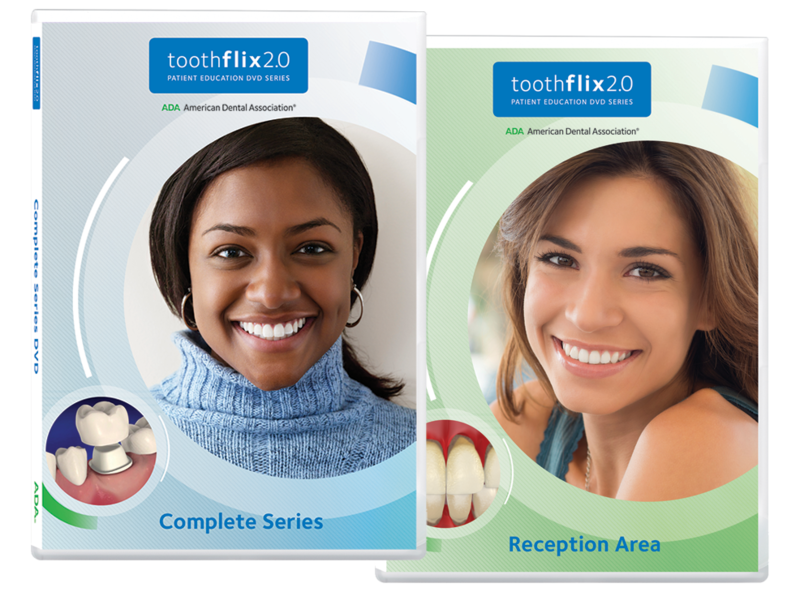 Show Toothflix dental patient education videos before a procedure, run the Reception Area DVD on a loop in your reception area, or take the DVD to school visits or group home presentations. And because Toothflix comes from the ADA, patients know it is information they can trust. Each segment runs 2-3 minutes. The Reception Area DVD contains both English and Spanish versions of 10 videos, with optional subtitles. The Complete Series has 26 segments on two DVDs (one English, one Spanish). One DVD per player; to show the DVD on multiple workstations, purchase the Server Version X830S. For Toothflix demos and additional information, visit www.ada.org/toothflix .